Nor-Cal Pest Control performs fumigations only as a subcontractor to other California pest control companies. We serve the Sacramento and San Joaquin Valleys. Fumigation is a method of pest control that completely fills an area with gaseous pesticides to suffocate or poison the pests within. It is utilized for control of pests such as drywood termites and wood boring beetles in buildings. 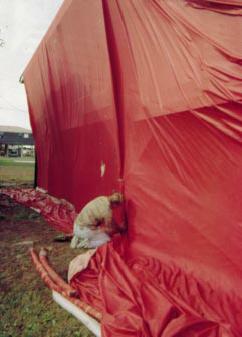 Fumigation techniques often differ from building to building, but in most houses rubberized tarps are placed over the entire house and Vikane, a pesticide is released into the residence. The tarps concentrate the gas inside the structure. The house must be vacated for the fumigation. During this time the residents of the house must find an alternate residence for three to five days. First, the area to be fumigated is usually covered to create a sealed environment. Second, the fumigant is released into the space to be fumigated; then, the space is held for a set period while the fumigant gas percolates through the space and acts on and kills any infestation in the product. Third, the space is ventilated so that the poisonous gases are allowed to escape from the space, and render it safe for humans to enter. The correct ventilation of the area is a critical safety aspect of fumigation. Fourth, after testing that the chemicals are gone, the house is released for reentry. Fumigation is a hazardous operation, and it is a legal requirement that the pest control operator carrying out the fumigation operation holds official certification to perform the fumigation. Nor-Cal Pest Control is licensed by the California Structural Pest Control Board to perform fumigations.